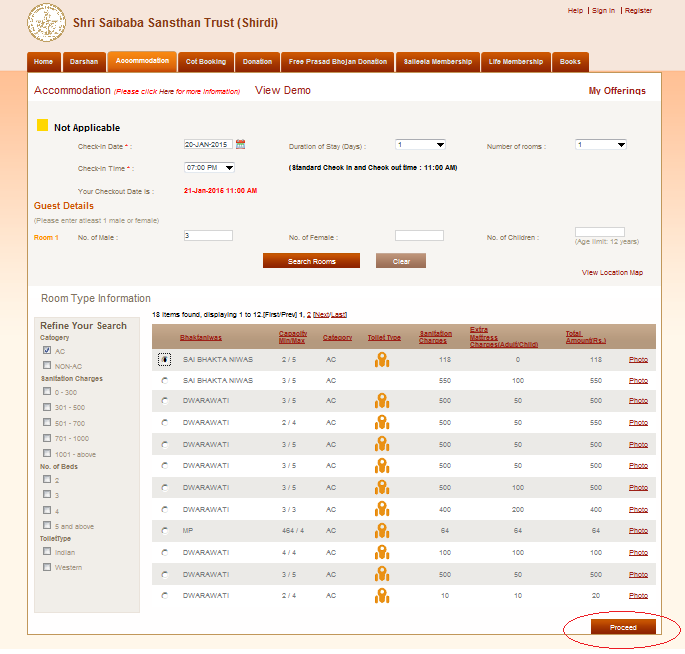 “Perquisite to Book Shirdi Sai Sansthan Accommodation Online is that Devotees have to have registration in favour of a person seeking Darshans”. 9. Other facilities like Shirdi Darshan booking, Cot Booking, Book Donation at Shirdi, Free Prasad Bhojan, Life Membership & Book related Shirdi Sai Baba are available if required. 10. An internet charge of Rs 10 will be levied for all online booking. ✅ Tip – Devotee can book maximum 2 Room booking online for 2 days of stays only. For staying beyond 2 days, fresh booking has to be done all over again by login again. This Screen shows Room Type information with all required facilities. User can also refine search. System generates & displays selected facilities in the cart as shown above. User can edit choices here. It will be covered in the coming sections.. 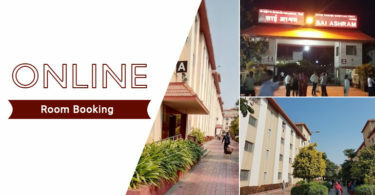 If you have any query on Shirdi Room Booking, please leave your comment below, we will get back to you at the earliest. First of all, Greetings & Om Sai Ram from Darshan Booking team. After booking Darshans at SaiOnline website, one has to book Shirdi Accommodation (Various Options like Bhakti Niwas, Bhakta Niwas) with AC or without AC. We suggest you to book with AC rooms at Shirdi as they are very comfortable. For more please read our Post on Shirdi Accommodation Photos & Reviews. Shirdi to Shani Shingnapur distance is 74 kms. And normally there are various taxi providers available to book Day tour and back. Hope this information helps you and let us know if you need to know more, we are happy to help you. my mother & father is of 70 years ,difficult to remain stand for long time ,how can they do DARSHAN.pl tell me. As your parents age is 70 years they came under senior citizens category. So, they are allowed for free darshan of Shirdi sai baba. The senior citizens are allowed for free darshan from gate number 3. Again and again sever busy what should I do.. Sometimes the Shirdi Sai Trust website is busy due to high traffic in the website. You can try in the night or evening when the server is not much busy. 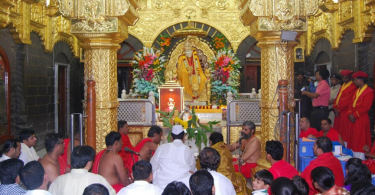 You can easily book Shirdi Sai trust for room booking when the server is not much busy. Madam you can get the accommodation for 6 persons with single room in SAI BHAKTA NiWAS which is located in Manmad Road, Shirdi, Maharashtra 423109. This Bhakta Niwas have only NON AC rooms with Indian Toilets facility. You can book online from Saibaba Sansthan Trust. Om Sai nath. Saprem Nameste. We are comming Shiridi for darhsan with my family on 15.10.2018. I want to do online registration for darshan and Aarti. we want to stay at shirdi sai Ashram or Dharmshala of Sai Shirdi from 15.10.2018 to 17.10.2018. what is the procedure for on line booking rooms for stay and registration for darshan. What we need to do it. I registered myself on official site and did reservation for a room for my family. As I am not coming with them and as receipt has been generated on my name, so this would cause an issue during check-in? There is no option for listing devotees who will stay there.